Autoliv, a major airbag supplier, is expanding into the active-safety segment with collision avoidance technology that recognizes obstacles in front of a vehicle. You might think that the market for collision avoidance systems -- with their complex mix of radar, cameras, processors and software -- would be dominated by a handful of megasuppliers. But it hasn't happened yet, and new players are jumping into the red-hot segment. Autoliv Inc. and Key Safety Systems -- ranked as the world's No. 1 and No. 4 airbag makers by Valient Market Research -- each is developing a portfolio of collision avoidance technology. 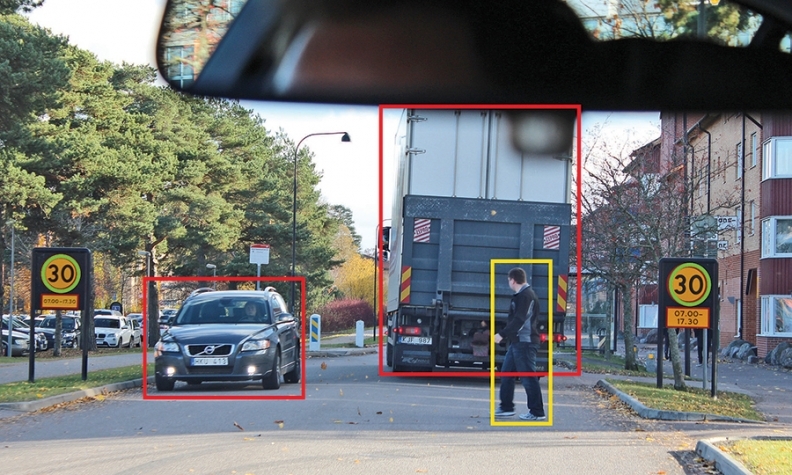 Likewise, Israel-based Mobileye enjoys strong demand for its obstacle detection software. Those and other companies are in a scrum with megasuppliers such as Robert Bosch GmbH, Continental AG, Denso Corp. and TRW Automotive to gain share in a segment with an annual growth rate of 20 to 30 percent. The suppliers know that automakers pay higher margins for safety-related systems -- such as collision avoidance -- that require complex software, fail-safe performance and periodic improvements. Obstacle detection software -- the "secret sauce" for collision avoidance -- has proved to be fertile territory for small companies such as Mobileye that specialize in software for automated driving. Mobileye has signed contracts to produce software for Audi, Volvo and other automakers. And on March 30, Mobileye and Key Safety announced a partnership to develop software to analyze visual data generated by Key Safety's cameras. Mark Wehner, chief technology officer at Key Safety, says the company is developing cameras for forward obstacle detection, 360-degree views around the car and driver alertness monitoring. But Key Safety won't design radar, lidar or ultrasonic sensors. "Radar is not on our road map," he said. "We believe we can work with others" who produce radar. "We see ourselves as integrators. We can optimize active and passive safety systems." To gain expertise, Key Safety has opened a technical center in the Silicon Valley. And in a move that hints at its market strategy, Key opened a technical center in Suzhou, China. In a March 24 press release, the company noted that it would focus on "advanced driver assistance systems." Key Safety's owner is FountainVest Partners, a Hong Kong-based investment firm that purchased the airbag maker in August. Will Key Safety target Chinese automakers as customers for its active safety portfolio? Time will tell. As Key Safety enters the collision avoidance business, Autoliv is starting to enjoy a payoff from its methodical expansion into the segment. The company acquired the radar unit of Tyco Electronics in 2008, followed by two licensing deals in 2011 to acquire lane detection systems and long-range radar. Since then, contracts have flowed in. Last year, Autoliv's active safety business generated sales of $489 million, and in January the company predicted 2019 global sales of $1 billion. The company says it's the world's biggest producer of night vision systems, and Mercedes' top supplier of radar. Autoliv hasn't piloted a driverless car from San Francisco to New York, as Delphi recently did. But Stefan Kroenung, president of Autoliv's active safety group, says the company has developed driverless prototypes to let customers test various safety features. He did not comment on speculation that Autoliv might help Volvo Car Corp. create a fleet of 100 driverless cars in 2017 for road tests in Gothenburg, Sweden. "We have a good relationship," said Kroenung, who noted that Autoliv supplied Volvo's first three-point seat belt. "We discuss a lot of safety opportunities." Fully autonomous vehicles aren't expected to hit dealer showrooms until 2025 or later, but collision avoidance technology is flooding into the market. According to Edmunds.com, 101 models are available in the U.S. with various forms of pre-collision safety equipment, up from 43 models in 2010. This category includes an array of actions a vehicle may take when it determines an accident is imminent, such as automatic braking, tightening seat belts, adjusting seat angles and closing the sunroof. Within this category, automatic braking is moving rapidly into high-volume vehicles. On April 7, Nissan Motor Corp. announced plans to make automatic braking standard on all volume vehicles sold in Japan by autumn. If that technology is cheap enough -- and reliable -- for mass-market use in Japan, the U.S. can't be far behind.